While my father-in-law was finishing up in the garage yesterday, I decided to get started on the dining room. The ceiling has had new drywall since his last visit in April, and my plan with the walls all along was to keep the existing drywall, but scrape off that really thick layer of whatever was on top of the drywall (I think it’s just many layers of paint, with at least one layer of wallpaper sandwiched in there somewhere, and at least one layer of really thick texture) and then skim coat and sand the drywall so that I would be left with smooth walls. That really thick layer scraped off very easily, and I had three of the walls finished in a relatively short time. And no, the pet station isn’t staying. 🙂 I need to get it listed on Craigslist and get it out of the way. Anyway, with the walls scraped, the plan was to just do a little repair in some places, and then start skim coating. The problem came when I tried to add new nails in some places where the drywall had pulled away from the wall just a bit, and each time I tried to put a new nail in, the drywall just crumbled. And then I found that the area underneath the window with the A/C unit was a complete mess. The whole thing was crumbly and gross, presumably from at least one leak from that A/C unit over the years. I finally decided that patching and keeping this drywall wasn’t an option, so down it came. And I found a few surprises along the way, like this row of tiny little eggs, which I’m almost certain are lizard eggs. It looks like a couple didn’t quite make it. I still need to finish the small area to the right of the front door, and then I need to move the buffet out and cover it so that I can do the entryway wall. So, see? Progress is being made in here! Although right now, it feels like I’m going in the wrong direction. 🙂 I’m hoping that by the end of this weekend, we’ll at least have the drywall up in the dining room and entryway, and have it partially (if not completely) taped, mudded, and sanded. I’d LOVE to have my new chandelier hanging by the time my father-in-law leaves next Friday. Those decorative things are what keep me going through all of this mundane work. And drywall is the absolute worst, in my book. So this room will hopefully be nearing completion by the end of this weekend, and then we’ll still need to repeat this whole process in the music room. 🙂 Fun times! And the music room will also include reframing the opening into the hallway. I want to widen that quite a bit so that Matt has an easier time getting through. In other news, we’re supposed to close on the condo next week. Finally! And in anticipation of that, I’ve scheduled an appointment with an HVAC person to come and give me a quote next Tuesday. We already got one quote from another company, and I’ll probably call at least one more. I will be jumping for joy the day we can finally pull all of these window unit air conditioners out of our house!! Although I might keep one for my garage workshop. That would be really nice to have in there during the hot Texas summer months. HVAC – music to the ears in this sweltering, relentless Texas heat! I’m so excited for you that that goal is within sight. It’s exciting too to see the front of the house coming together. You are awesome. Have a good Labor Day holiday! Interesting that so much ship lap is used on the interior wall….do you know if that’s a regional thing? I’ve never encountered it–but then I’m used to full brick construction with a plaster interior. This looks like great progress. Would your FIL like to visit St.Louis anytime soon? Just kidding. Glad it was you who found a whole mess of eggs like that–I’d be on a total freakout. I’m pretty sure it’s a regional thing, but it’s not done anymore. Now they just put drywall right over the studs. It’s really an “older home thing” – LOL. I have it in my 1930’s Craftsman style bungalow here in Louisiana. I jokingly say I can hang a Buick off any wall in my house. 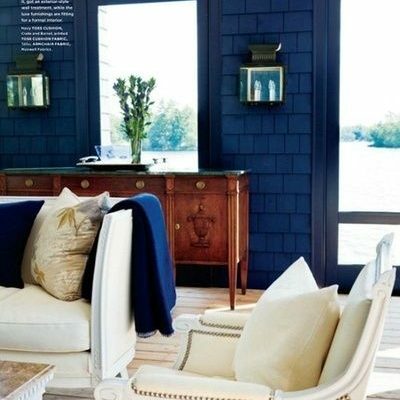 Love that shiplap. I think it is an older home regional thing. I have a 1940s home in Nebraska and the original walls are old crumbly plaster with lath under them. I would love to find shiplap under mine! Good call to head off the inevitable questions about painting the shiplap! It doesn’t look like it was ever intended to be exposed. But I wonder why they were used at all? Is that just a regional building practice? I really don’t know why it was ever used, but I do think it lends a great deal of structural integrity to the house, so I’m keeping as much of it as possible. And it’s not something that used any more, and probably hasn’t been used since the 50’s. Just wondering how your niece’s bedroom is coming? I imagine she has started back to school and is anxious for her room to be completed. Can’t wait to see it finished Kristi! It’s pretty much on the back burner right now while my father-in-law is here. Unfortunately, we weren’t able to get it finished by the time she started school, but she’s pretty proud of the things we were able to finish. Once my F-I-L is gone, I’ll start splitting my time between my house and her room again until her room is finished. Then I’ll be focusing on my house full time. 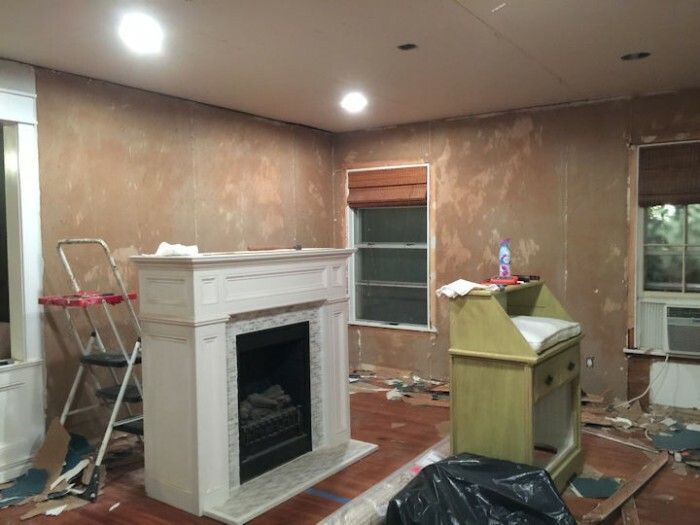 Congrats on getting close to getting the walls done in the dining room and music room. Things will move right along once the walls are out of the way. Have you considered replacing those dining room windows now rather than later? Seems a shame to trim out windows that are going to be replaced. I have considered it, and since we’re closing on the condo next week, I’m really hoping I can sweet talk Matt into letting me get new windows in there. 🙂 It’s not something we had really planned on doing right now, so we’ll see how that goes. So happy you’re taking everything down to the shiplap and making everything new. That way you’ll never have to do anything like that again. All that shiplap must be the insulation, or is there more insulating between the shiplap and the exterior of the house. Central heat and air will be a real blessing, but you will need to remember to insulate the attic more and the crawl space, in order to keep the bill down. 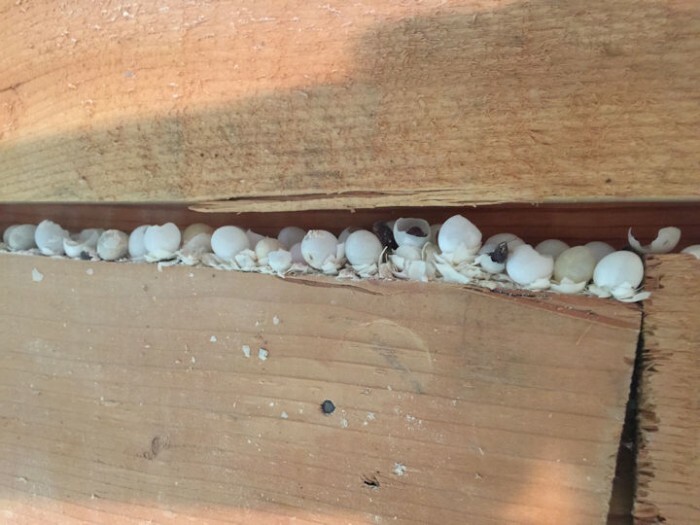 Nope, there’s no other insulation in the walls. The only other thing giving any insulation is the foam insulation stuff that backs the vinyl siding that’s on the house. Matt wanted me to insulate before drywalling, but that would mean taking down all of the shiplap, and that’s not an option. I really do think that the shiplap gives quite a bit of structural integrity to the house, so I don’t want to remove it. So we’ll just have to wait until that glorious day when we can get rid of that awful vinyl siding, and have them put insulation in from the outside before they put up the new siding. Insulating the attic is on the “to do” list just as soon as the HVAC system and ductwork goes in. I just though it would be easier for them to work up there without having to dig through a bunch of insulation. In fact, I think some HVAC companies will also blow in insulation after the HVAC job is done, right? I might ask about that and see if they’ll include that in the quote. No insulation in the walls???? In TEXAS? Oh, my gosh, that’s a real bummer. Is there any way you can have them blow insulation into the walls before you install the sheetrock? My understanding is that they just cut holes into the shiplap and then put the nozzle into the hole and fill each cavity. That would make such a HUGE difference in your comfort level, not to mention electricity bills. Replacing the windows at this time too would mean you won’t have to worry about it in the future. I know you are eager to get to the ‘pretty stuff’, but I hope you can complete the hidden stuff too! Congratulations on the sale of the condo, I know that will be a load off your mind. Keep on truckin’, Kristi, sometimes it seems like it’s two steps forward and one step back, but you ARE making progress. By the time you’re done, you’ll have the equivalent of a brand new house, lol! You and your FIL are making great progress. Congrats on selling the condo and I hope you can get A/C installed soon. Good idea to save a window unit or two for your garage workshop. We had an invasion of baby lizards in the house last spring so I’m pretty certain I have a cache of lizard egg shells somewhere also. Wonder where I’ll find mine? I think so too. I would much rather find lizards than roaches. Yuck. We get bats every now and then. That’s why you don’t have roaches. Lizards eat them! I wish I had some, but my cats, would wort them to death. I do have scorpions, and spiders, including brown recluse, so a few lizards would be welcome! Oh my…being from northern Indiana, those lizard eggs would freak me out! EWEWOOO! Love hearing how other parts of our wonderful United States deal with those things though! I know that 2 walls are exterior walls. Are you able to add insulation at this time? I know back in the 50’s they didn’t worry about it. You can do replacement windows. They really aren’t that expensive . You ought to get some estimates. You may be surprised. I won’t be doing insulation right now because that would require removing all of the shiplap. Unless, of course, we do the blow-in kind, which is more expensive and not really in the budget right now. I’d rather keep the shiplap, and wait until we replace the vinyl siding on the exterior, and have them insulate at that time. But windows are a completely different story. I’ve already talked to Matt several times about replacing the windows, at least in this front room, while I’m working on it right now, rather than having to come back at a later date and replace them, and then repair any damage to the walls and replace the trim again. And since we’re closing on the condo next week, I’m really hoping I can convince him that this is a good use of some of that money right now. 🙂 We’ll see how that goes. I’ve already gotten a quote, and this room would cost about $1500 for new windows. Kristi, Have you talked to Champion Windows. I had all of the windows in my whole house replaced by them (Double Hung, Double pane UV protectant thermal glass called Comfort 365 glass) for less than $4000. and I had 16 windows that needed replacing. Here is a link to the windows I got: http://www.championwindow.com/windows/styles/double-hung/ I really love them and the company did a great job. You may want to contact them for a quote. We live in South Florida and I want to imagine the heat must be similar to Texas’. Dining Room, if you will be making an access way to the Kitchen from the Dining Room or will you have to carry food, dishes, etc., to the Dining Room via the Music Room? 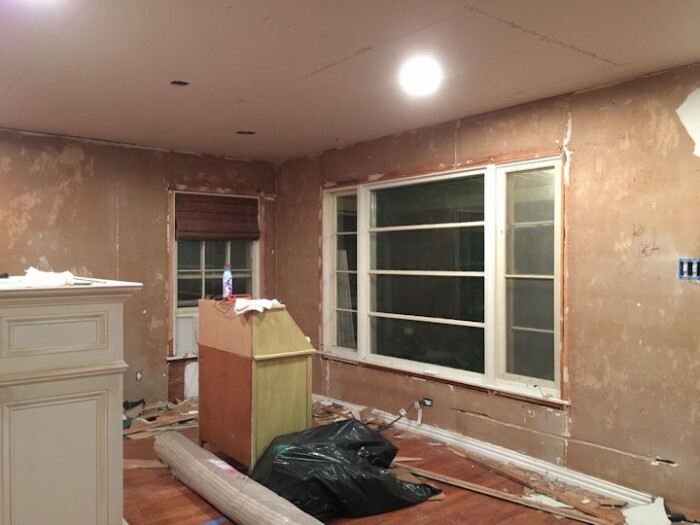 I also thought she’d planned to put an opening in the wall between the kitchen and dining room…maybe this is in the plans before the drywall goes up? Then again, Kristi never seems afraid to do something on a temporary basis just to make progress. I thought the same thing…why not add the doorway to the kitchen now, and it would be another light source for the kitchen through your potentially “new windows” 🙂 You are my hero Krisit…love your abundance of energy, your determination and your creativity! I’m so happy you did an update before the long weekend. I truly look forward to reading your blog each day, sad when you don’t post. It great to see so much done! I love all the ideas that you shared on garage/workshop. It gave me some great ideas! Can’t wait for the dining room and music room are done, I just know they are going to look fabulously! Hi Kristi. Agree with a/c in garage. We had our new hvac upped a 1/2 ton to accommodate the two vents added in our garage. We just open them when we need too. We keep the door closed most of the time simply because the heat that comes off the black paved drive makes it unbearable in there. The vents made all the difference in the world. So looking forward to the end of this for you. You truly amaze me with your determination and success. Have a fantastic holiday weekend everyone. Kristi, just wondering, what’s the insulation situation? It looks like there isn’t any. Awesome progress! So glad you’ve a father-in-law that jumps into the diy arena! Hope you all take a break this long weekend to enjoy some family time! OHHHH I am so excited for you! Closing on the Condo will let you get a large project out of the way and make the house so much more comfortable for you and Matt. (I am sure he will give you the windows, LOL). I love that you will have nice clean walls for your dining room. I hope that some mudding and taping will get done. Help with any of it will leave you with less to deal with later. God Bless your FIL. So much to do but so much done!!!!!!!!!!!!!!!! Just very happy for you and Matt. As a fellow TX resident, my hat it off to you that you even made it through the summer without HVAC! I don’t imagine Waco was much cooler than Houston!! 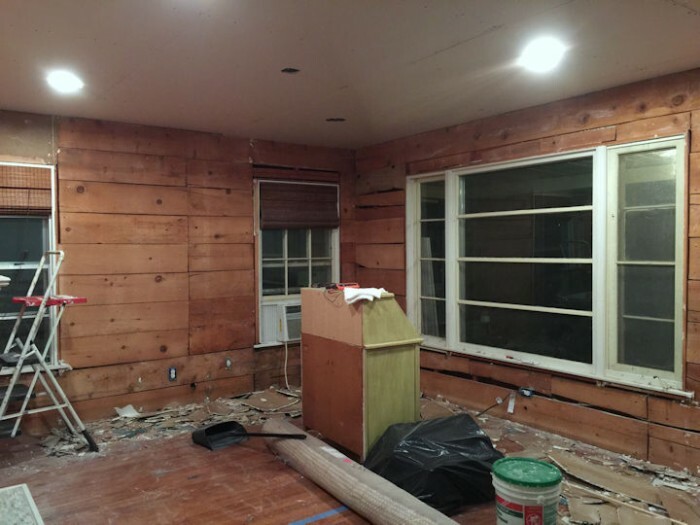 I’m really looking forward to seeing your progress on the dining room! 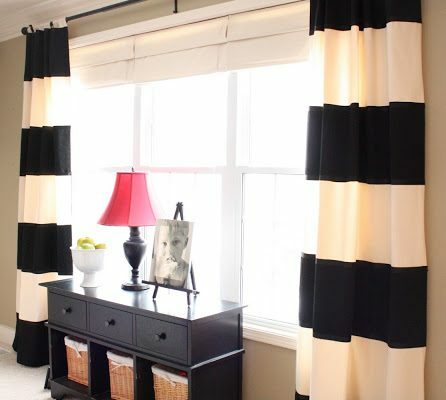 Wow Michelle, you made my day sharing my curtain tutorial! I noticed a few people had come to my blog from Kristi’s and popped over to thank her if she had featured something. It was an even better suprise to see that it was a reader sharing something they liked! Have a great weekend! 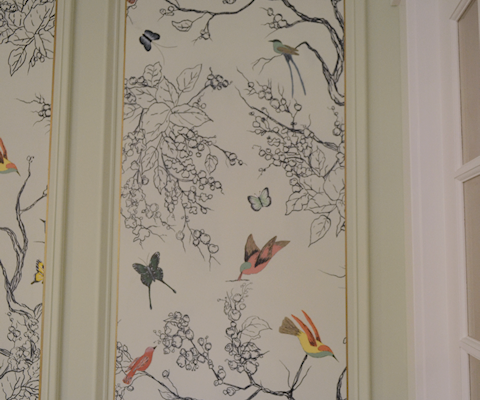 And Kristi – can’t wait to see how the dining room ends up. I’m not envious of your big project! Wow, that must feel great-everything, it’s all great news! Hi Kristi…. Soooo happy you have an able bodied “Helper” for a little while. You are making such grrrreat progress…. 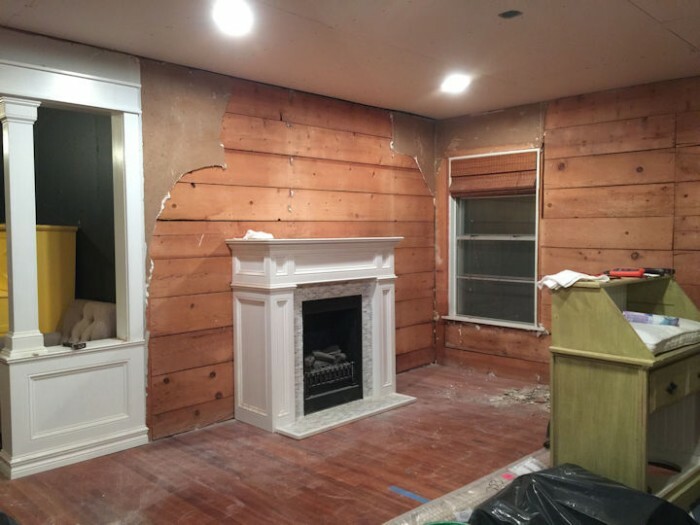 Quick question… I’m curious….. Is there any insulation between the outside wall and the shiplap? Your home is going to be like brand spanking new when you are finished. You’ve really been making some great progress. I’m making a triple birdhouse this weekend which is a real task for me but seems so elementary compared to what you do on a daily basis. You’re quite an inspiration! I’m so glad you did an overhaul before the long weekend. I really anticipate perusing your online journal every day, miserable when you don’t post. It extraordinary to see so much done! I adore every one of the thoughts that you shared on carport/workshop. It gave me some awesome thoughts! You are such an inspiration on how you get thing done. I have been viewing your progress for the past few months and decided at age 58! that it was tie to remove the ugly popcorn from the ceiling in my familyroom. What a messy job I did some and my son did the rest. I look reading your accomplishment with your home it keeps me motivated for what I am doing. I am sure your are a huge inspiration to others as well. How funny is it that on my computer, just below the photo of the lizard eggs is a button for a “Quick Sausage Alfredo” recipe! Love the shiplap. are you planning on keeping it on any of the walls? Maybe your dining room would be too formal. You have gotten so much done. You never cease to amaze!